Can't remember where I first ran across this recipe, but it's from the Pillsbury site. I always approach these types of recipes with caution. Sometimes they are just designed to use lots of the company's products, but don't offer much flavour. What drew me to give it a try? 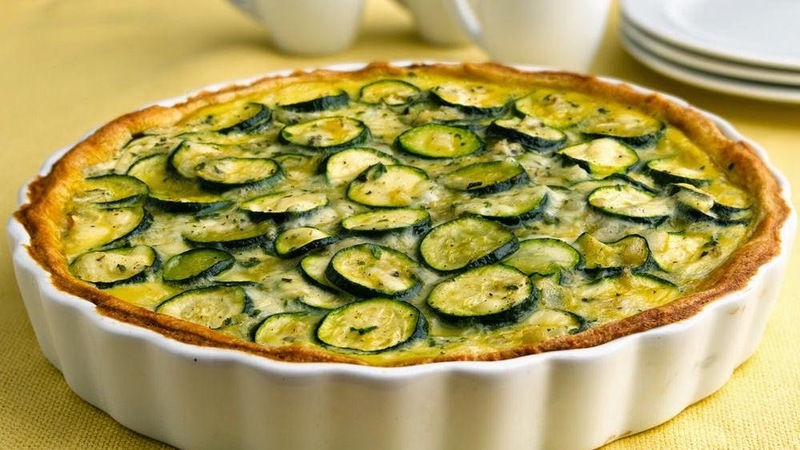 The recipe is a quiche style vegetarian option using zucchini. I love zucchini, but only have a few go-to recipes. I tuck it into stir-fries, include it in my Roasted Vegetables with Maple Balsamic Vinegar, make Zucchini Bread and occasionally offer it as the vegetable on it's own with a meal. The fact that it can be overcooked so easily makes me tend to shy away from using it more often. I get distracted in the kitchen. I also love vegetarian food, but struggle to work it into the menu for a family of committed carnivores. What I told them when I served this was if they wanted meat they could make themselves some bacon. No one bothered. In the end their plates were clean and there was nary a complaint, so that's as good a thumbs up as you'll get for a meatless dish in this house.. The final draw for me was the super easy crust. Making crust takes time to accomplish and the rolling out process always creates a mess. The front of my shirt in particular ends up covered in a dusting of white flour. Here you take a tube of crescent rolls (I chose the wheat option) from the refrigerator section of your local grocery store, open it and press the dough into a pie plate. How easy is that? I did make a few changes to the original recipe. The garlic powder was replaced with minced fresh garlic and the suggested Mozzarella or Muenster cheese was replaced with a flavour filled smoked Gouda. The final dish was still VERY mild, so I'm glad I chose a stronger cheese. There are only 2 eggs in this and 2 cups of cheese, so taking bites meant occasionally dealing with long strings of cheese just like with pizza. Enjoy! Heat oven to 375°F. In 12-inch skillet, melt butter over medium-high heat. Add onion and garlic and saute for a few minutes. Add zucchini and continue to saute stirring occasionally, until tender. Stir in parsley, salt, pepper and italian herbs. Cool to room temperature. In large bowl, mix eggs and cheese. Add cooked vegetables; stir gently to mix. Separate dough into 8 triangles. Place in ungreased 10-inch glass pie plate, 12x8-inch (2-quart) glass baking dish or 11-inch quiche pan; press over bottom and up sides to form crust. Firmly press perforations to seal. Spread crust with mustard. Pour egg mixture evenly into crust-lined pie plate.